OMD Sydney has raised over $16,000 at their annual ‘Pyjamathon’ fundraiser for children’s charity The Pyjama Foundation. It is their most successful fundraising initiative for the charity to date, raising over $4,000 more than last year’s event. 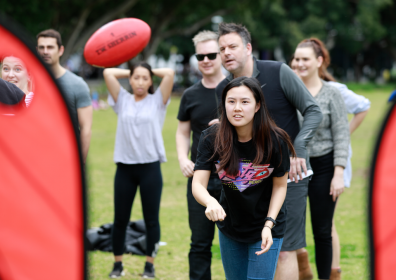 OMD’s ‘Pyjamathon’ is a competitive event, consisting of 16 teams, racing around Pyrmont to complete a series of challenges ranging from dizzy bat relays, to creating spaghetti towers. The event was organised by OMD Sydney’s social responsibility pillar, OMDonate, of which The Pyjama Foundation is the principal charity partner. Aimee Buchanan, CEO, OMD Australia, said “At OMD, we recognise the power of our industry to give back to the wider community. Jonathan Betts, group business director and The Pyjama Foundation lead on OMD’s charity committee, OMDonate, said: “Pyjamathon is rapidly becoming people’s favourite day at OMD. Bronwyn Sheehan, founder and executive director of The Pyjama Foundation, added: “OMD has been a fantastic supporter of The Pyjama Foundation for the past few years and we’re so thrilled to know more than $16,000 has been raised from their Pyjamathon. Through its network of Pyjama Angels, The Pyjama Foundation empowers children in foster care with learning, life skills and confidence to change the direction of their life. Over the last three years, OMD Sydney has worked with the Pyjama Foundation for its National Pyjama Day, securing over $2.5 million in media value with help from its industry partners.